A handy sized glass germinator jar ideal for those with limited space or who require a smaller batch of sprouts. I have had one of these for several years and found it more robust and convenient than all other fiddly, awkward germinators. You just soak the seeds overnight then tilt the bottle to drain the water. Add fresh water daily and tilt to drain until the seeds have sprouted then keep them in the jar in the fridge. It was so good I could take it to work and keep the sprouts in the fridge there to add to my lunch each day. Trouble was it got nicked from the washing up drainer one day as someone else had taken a shine to it! I was therefore delighted to find it for sale and have ordered a new one. Bliss! 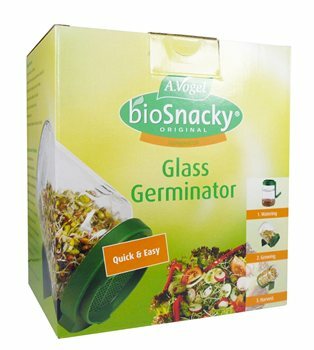 I love this Bio Snacky Germinator.It easy to use. Just put the seeds inside and with the easy lid you can rinse them every day. Within four days you have your snacky full of dilicious sprouts. Easy to use and great size sieve - it doesn't let the smallest of seeds through. Easy to rinse the sprouts, and works great with the supporting angle. Easy to use, solid quality.